Italy and metal has never really been a truthful combination. It's only Lacuna Coil that has always grasped me by the throat. And hey, what do I find here? 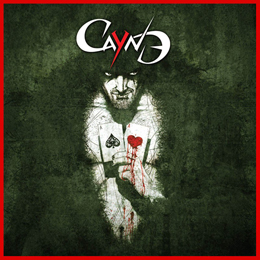 Cayne, an Italian rock metal band with former members of Lacuna Coil. I was really waiting for this to happen, for real! I'm super curious what this will sound like. Cayne already formed in 1999, but for some reason I never really got to know of their existence. It's just only now that they say to have a solid line-up and sound. The album is self-titled, which I don't really get, but it seems to work splendidly! After listening to Cayne for the first time, I was pretty sure I'd just discovered a wonderful new rock sensation with all the positive elements of Lacuna Coil, because, honestly, it really sounds like them! The intro already brings us into the correct vibes: nicely produced industrial sounds with the combination of an enchanting mermaid that lures us into the guitars opening for the first track “Waiting”. This first song brings us a bit further away from Lacuna Coil, more towards an Alter Bridge rock sound. The vocals sound amazing, both the melodies and lyrics are incredibly catchy and it's all very accessible to a broad audience. On songs such as “Together as one”, the use of keyboards brings an extra soft touch to the guitar dominated sound of Cayne. It's really striking how much variation Cayne is able to bring on one record. “King of nothing” is bone hard and grasps you by the balls from the very first note. “Little Witch” brings us back to some peace and quiet, being a bittersweet ballad. Cayne have come a long way to release this album, but it's surely worth it. The album is solid, brings tons of variation and paves a bright future for these Italian rockers. Great album! A must hear!